Sky ponders the objective, directly above him. 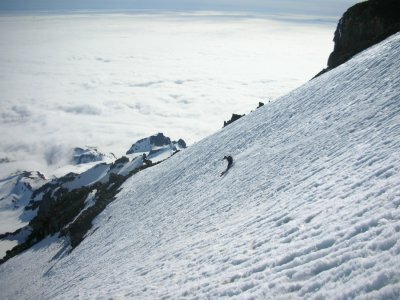 For really extreme descents, the best tool may not be a pair of skis at all, but a snowboard. What's this, averaging 50 with some sections at 60? This description screams "Ski Sickness!" and demands investigation. One thing that delayed the diagnosis was a longish approach. 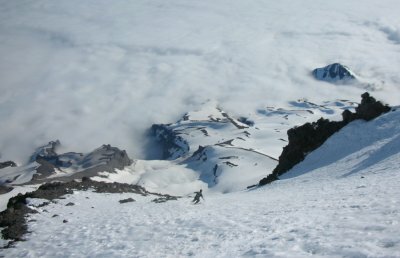 As of last week, it had somehow become the only "reasonable" one-day route left on my Rainier list. Three hours into the day, we left Paradise as four. I was accompanied by two gluttons for punishment plus one fresh victim, Dave B. Admittedly, my goal was ambitious, especially for a new acquaintance; but Dave seemed adequately experienced, having made many trips in the Colorado Rockies and Wyoming's Wind River Range. 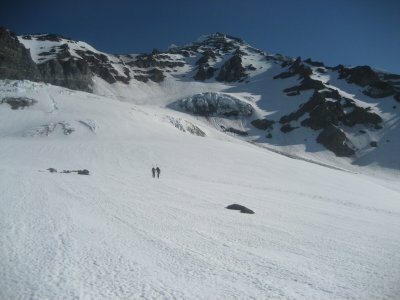 We approached from Paradise, across Nisqually and Wilson Glaciers, across Van Trump Glaciers, then finally crossing the Kautz Glacier. The distance may not have been much less than from West Side Road, but it was nice to use skis and minimize the effort. The eastern couloir was an easy choice. A bergschrund spanned the bottom of the other two, which looked littered with rockfall anyway. East Success Glacier Couloir had the least rockfall and appeared to be the most aesthetic of the three for a ski descent. 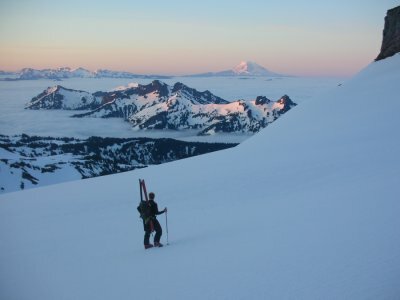 Dave B. enjoys a beautiful sunrise from the Wilson Glacier. Sky and Dave hike Success Glacier toward the couloirs. Sky boots toward SGCs with Mt Adams in the background. Dave and I maintained a steady pace and found ourselves ahead of the others. Unfortunately, the two gluttons already had their fill below the bergschrund. It seems that a large, falling rock may have stymied them; they claimed fatigue during debriefing. There hadn't been an obvious way to avoid rockbands from below. Sometimes, foreshortening makes the situation look deceptively bad. By the time we reached 12k, close inspection offered no relief; the rockbands were inevitable. We climbed through three rockbands. After the first, most difficult of the three, my motivation was lacking. I just wasn't stoked about a bunch of rockbands. Dave saved the day by chugging ahead at full throttle. The next rockband was just a mellow, volcanic beach: a lovely afternoon, soaking in the sun at the screeside. The last rockband was guarded by steep, rotten snow, but by that time I was in the lead again and feeling a little summit fever along with my Ski Sickness. Dave climbs through the first rockband. The clouds had been lapping at the mountain all day. The Tatoosh Range and Pyramid Peak would both come and go, depending on whether the maritime cloudbank was at high tide or low. 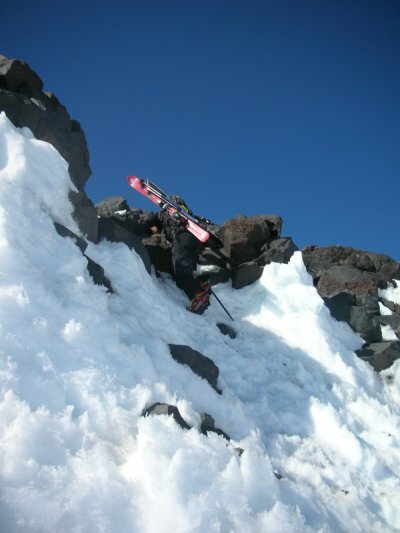 This made me anxious; we spent very little time atop Point Success before clicking into our skis. The clouds hit another low some time around our first downclimb, which eased my anxiety. Making the return traverse to Paradise in a whiteout would have really stunk. And now - beautiful! - we get to downclimb all those rockbands we were dumb enough to climb. Round 1. The snow was soft throughout the route. There were no slips on the fifty-degree scree, the hard ice below first/last (climb/downclimb) rockband had softened, and finally we were left with a very beautiful 3,000 ft to ski down East Success Glacier Couloir and Success Glacier to where we had left our gear. 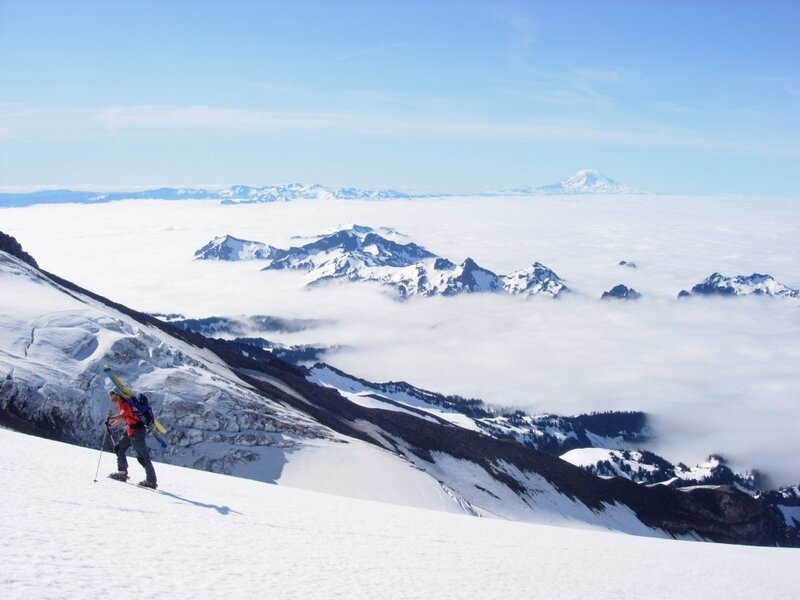 Dave skis above the clouds. The traverse that had been so quick in the morning seemed painfully long on return. Maybe not for Dave; he seemed pretty tough. We found ourselves above the Wilson Glacier circa seven in the evening, too late for optimal snow, but quite happy that the clouds weren't hiding the Nisqually Glacier. Great first trip, Dave! Seventeen hours for Success. Sorry to my other two compadres; we'll nail the next one. 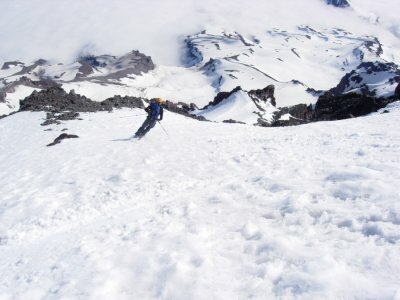 Barring significant June accumulation, I can't think of anything else I want to do on the south side of Tahoma this season. 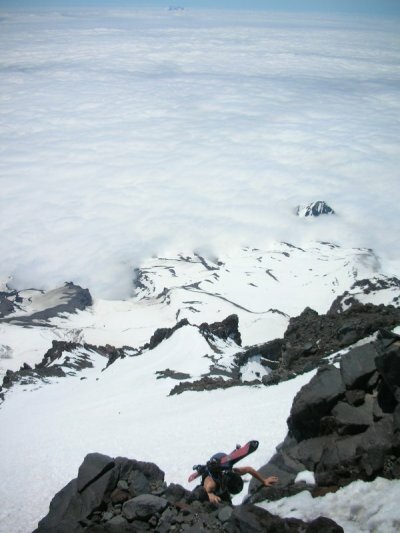 That is, anything other than drinking beer, making lazy turns down the Muir Snowfield, and lounging in the sun. That might be fun. Success Glacier Couloirs are beautiful and worthy lines. Proud descent, Luke and Chad! 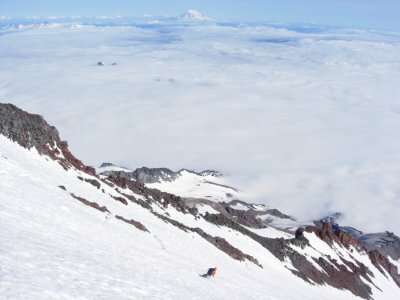 Now, why haven't any snowboarders been schussing steeps in the northwest recently? I was ready to talk all kinds of trash, but Success Glacier Couliors may merit that description. 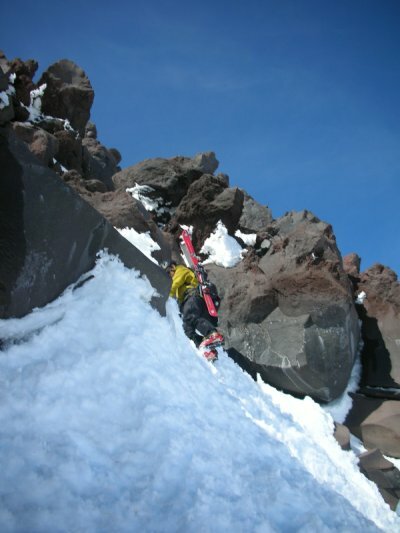 I think the rockband at the top was the same one I sidestepped to make a complete Kautz Headwall ski descent last June, which seemed pretty 60°-ish to me. 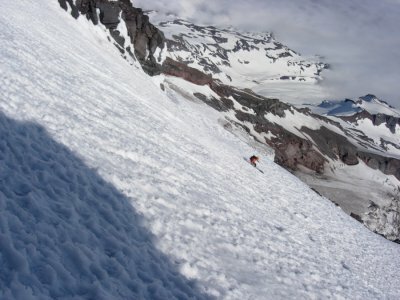 Overall, I prefer the Kautz Headwall because it goes directly down the gut, instead of having that slightly traversey feel from Point Success to the Success Couloirs. I don't think the Point Success lines are as difficult as lines like Liberty Ridge, Central Mowich Face, or Sunset Ridge. Regardless, these south-facing routes deserve more descents. The real beauty of them is that as long as there's snow, it will soften with the sun like clockwork. 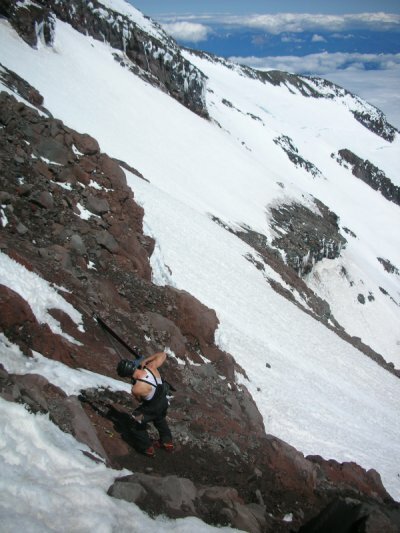 There's no glacier-ice problem like on the steep north faces. 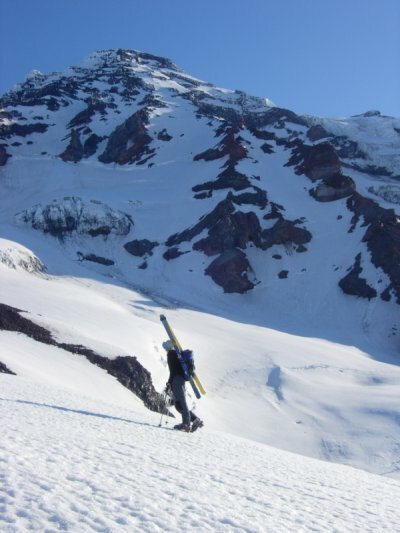 I will return to ski these steep, south-facing beauties year after year; conditions on Rainier's north-facing routes are much more ephemeral.